Bokar Rinpoche (Tib. འབོ་དཀར་རིན་པོ་ཆེ་, Wyl. 'bo dkar rin po che) or Karma Ngedön Chökyi Lodrö (kar+ma nges don chos kyi blo gros) (1940-2004) — heart-son of Kalu Rinpoche and an important holder of the Karma Kagyü and Shangpa Kagyü lineages. 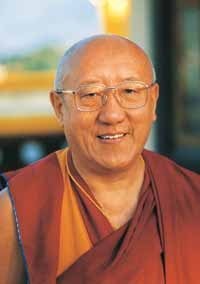 He taught many Western students of Kalu Rinpoche, and established centres in the West, mainly in France. He founded a monastery and retreat centre in Mirik, India, which holds the special lineage of Kalachakra practice. This page was last edited on 24 July 2017, at 03:26.